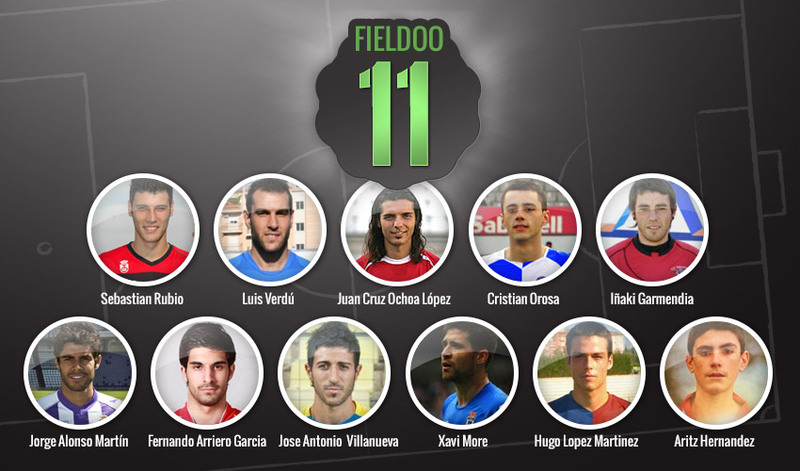 Fieldoo – football network for players and agents – is presenting a new category Fieldoo 11, where we feature eleven our users that stand out from the rest. This week we are shedding a light on Spain’s top eleven Fieldoo users, football players from a country that won the last World Cup and the European Championship. is a 191 cm high goalkeeper that was keeping the sheet of Ronda on 25 matches in Spain’s 3rd division. He also helped CD Leganes to advance from 3rd to second division. Curiously enough in his video presentation you can see him scoring a goal for his team with a great header after a corner kick. What more could you wish from a goalkeeper. is a left defender of 3rd division Bakú Deportivo Hellin, who is confident in defence and likes to join to attack. That’s why it’s no wonder that his goals are quite frequent. is a free player that was a central left defender of Orihuela. He played in the Spain’s 1st division for three seasons with Alaves, Numancia and Real Murcia. He was guarding Lionel Messi and Thierry Henry when he played against Barcelona, and not only that, he scored the first goal in that game. You can see Juan Cruz Ochoa López scoring goal against Barcelona in this video. was playing in 1st Spanish division as a youth player and is central right defender of U-21 national team player of Andorra. He also played in Andorra’s 1st division, Spain’s 2nd and 3rd division. He plays for a little footballing nation and is presenting a big problem for other national team scorers. is a right defender in the Spain’s 2nd division, where he played for Mirandes. Cup quarter final win over Espanyol is his fondest memory. is a central midfielder that is playing in Spain’s 2nd division from season 2006/2007. He played for Salamanca, Hercules, Real Valladolid and Racing de Santander. an attacking midfielder that played for Atlético from Madrid and FC Barcelona as a youngster. After that he went to Poland in Widzew Lodz and later returned in Spain, where he was playing for Villarreal and Talavera de la Reina. He has a great technique and is a good goal scorer. is a free footballer that is searching for a new club and an agent. A left winger has a great technique and dribbling and he scored a goal for Spain’s national team against the Faroe Islands. In his career he already travelled the world as he played in Spain, United Arab Emirates, Morocco and in Cyprus. Defenders can usually stop him only with a foul. is a right winger with great crossing that played two seasons in Spain’s 1st division for Real Valladolid. Footballing legend Roberto Carlos was trying to stop his attacks and failed in the match against Real Madrid. In the last four seasons he played for Real Oviedo in the Spain’s 2nd division. You can see Xavi More scoring his goal against Real Madrid in this video at 1:30.
is a very fast footballer and great dribbler. He played for FC Barcelona for seven years in his youth years, before moving to Almeria and Real Sporting. After that the second striker joined Atletico de Portugal in the Portuguese 2nd division and travelled to Bulgaria, where he played for Slavia in the 1st division. He is now playing for Israeli club Ironi Ramat Hasharon. is only a 15 year old striker of Spain’s Atlético de Madrid and is a great talent as he scored numerous goals in the last season. With his 185 cm his heading is one of the very best in the league.